ThriVe® offers confidential STD testing for women that is low cost/no cost. 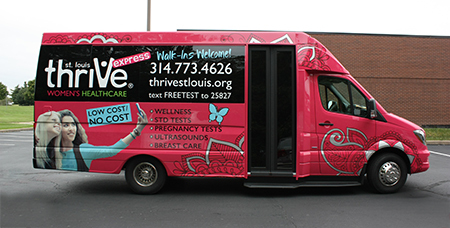 ThriVe® St. Louis tests for Chlamydia, Gonorrhea, HIV, Syphilis, Bacterial Vaginosis, and Trichomoniasis, certain criteria apply. All women considering abortion should be tested for STDs even if they are not experiencing any symptoms to ensure that there are no possible complications. Make an appointment today! Call our helpline number to make an initial appointment or to make a retest appointment within 12 months from initial testing. All females 15 – 64 years of age may be tested. Certain criteria apply. Screening males – certain criteria apply. While Bacterial Vaginosis is not considered an STD, having Bacterial Vaginois can increase the chances of getting an STD. Symptoms may include thin white/gray discharge, fishy odor, itching, and others. Most people with Trichomoniasis don’t show any symptoms, but symptoms may include yellow/green discharge, itchy burning, redness, and others. All females 15 years of age and over may be tested. Condoms may reduce risk of contracting some STDs if used consistently and correctly each time. However, human error reduces their effectiveness.